Tuesday February 20th 1923 I did some fancy work in the AM. We went to see "Dr. Jack" in picture show. I got letters from Hattie, Millie and Nora Wills. Evening at home. weather warmer. Wednesday February 21st 1923 I wrote to Lizzie Lindley and sent check for birth day. I also wrote to Ott. It was 23 years today since Will and I went up to look at the Coralville place with the view of buying. How fortunate we did. Went to town late in PM for mail. Evening to meeting and a picture show. Wrote to Nora Wills. 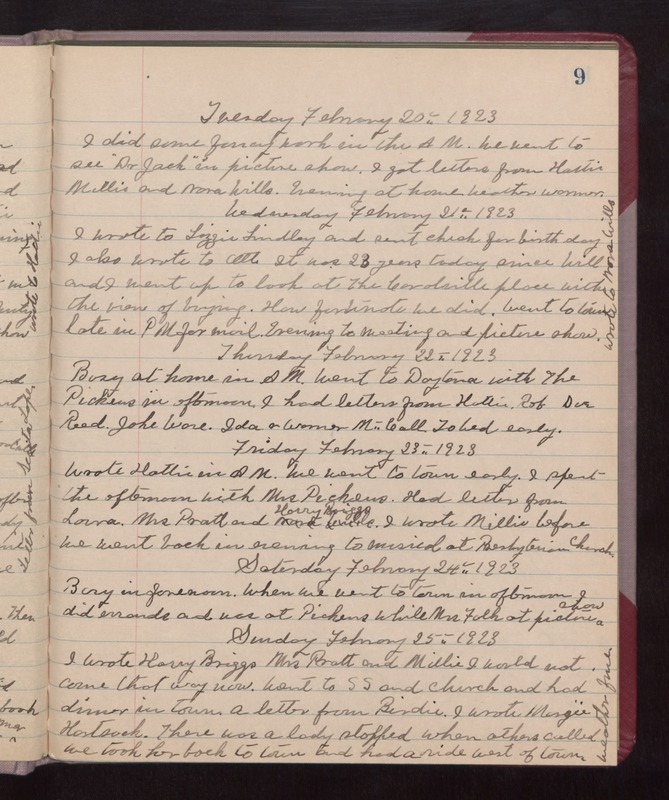 Thursday February 22nd 1923 Busy at home in AM. Went to Daytona with The Pickens in afternoon. I had letters from Hattie, Rob. Sue Reed, Jake Ware, Ida & Warner McCall. To bed early. Friday February 23rd 1923 Wrote Hattie in AM. We went to town early. I spent the afternoon with Mrs. Pickens. Had letter from Laura, Mrs. Pratt and Harry Briggs. I wrote Millie before we went back in evening to musical at Presbyterian Church. Saturday February 24th 1923 Busy in forenoon. When we went to town in afternoon. I did errands and was at Pickens while Mrs. Folk at picture show. Sunday February 25th 1923 I wrote Harry Briggs, Mrs. Pratt and Millie I would not come that way now. Went to SS and church and had dinner in town. A letter from Birdie. I wrote Margie Hartsock. There was a lady stopped when others called. We took her back to town and had a ride west of town. Weather fine.